George Graham Reviews Jah Sun's "Between the Lines"
As we pointed out a few weeks ago in our review of the new album by the Boston band The Elovaters, the reggae scene has evolved into different directions, with hip-hop influencing one school and the more traditional reggae artists continuing a sound more influenced by Bob Marley and his more melodic approach. This week we have another reggae project that reflects the more tuneful side. It’s by a California-based artists who goes by the name Jah Sun, and it’s called Between the Lines. Jah Sun, whose real name is reported as Jason Andrew McCommas, and receives songwriting credit as J. Staniford, was born and grew up around Hawthorne, California. He had a difficult upbringing, born to a sixteen-year-old mother, who soon had two other children, and with an absent father, young Jason found himself at an early age on the street hustling, and having numerous scrapes with the law. To try to help himself, he came to Pennsylvania to live with his in-laws, who apparently did not think much of the hustler. He said he worked as a laborer to pay for legal defense. While he was on trial at age 20, he happened to discover the music of Bob Marley, which he said changed his life. He had been involved with doing rapping since age 12, and did some touring and performing with some established rap artists. But it was reggae that he said turned him around. He was also facing prison for drug dealing, married, and with a baby on the way. At that point, he resolved to dedicate himself to reggae, and was inspired by Bob Marley’s often uplifting music. He said it helped him to alter his lifestyle, becoming a vegetarian, growing his requisite dreadlocks and “changing his perspective,” as he described it. His court case ended up resulting in nothing more than some probation and his son was born healthy. In 2006 he released his debut album Height of Light, which began to attract accolades in the Los Angeles area. It was in 2012 that he released an album called Battle the Dragon, that began to widen his reputation geographically. 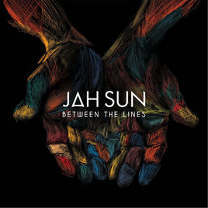 Now Jah Sun is out with Between the Lines and it’s a very appealing record that is uplifting both musically and especially lyrically. There is some world music influence and a couple of rapped verses, but it generally hews to melodic Marley style reggae. Most of his songs have almost dewy-eyed optimism and gratitude, with some love songs and a couple about how he is so thankful he turned his life around, and by extension inviting others to look at the sunny side. Despite all the sweetness and light, the album is never excessively cloying, the music is tasteful and features a nice dollop of eclecticism, and a refreshing absence of commercial pop cliches like fake hand-claps or auto-tuned vocals that are such ubiquitous and annoying fads on the pop scene. Jah Sun’s music also features some acoustic instrumentation and a frequent horn section that evokes classic soul more than typical reggae. Jah Sun’s colleagues on his album include the members of the band Dubtronic Kru, who provide many of the band rhythm tracks, plus additional horn players, and frequently heard backing vocalist Nikki Burt. Between the Lines the new release from Jah Sun is a collection of appealing reggae influenced music that features uplifting, positive lyrics with a danceable reggae and world-beat sound that’s very tastefully done. There’s a nice degree of eclecticism with the horns and occasional strings woven into the arrangements. Jah Sun himself has a winning musical personality and clearly and unabashedly shows his Bob Marley influence, which is nothing to be ashamed of. The album deftly walks the line between the upbeat and optimistic and the overly sweet and comes down on the side of good taste. Our grade for audio quality is close to an “A.” The sound is warm and the drums have a nice punchy sound. And like a lot of the other aspects of the album, the recording avoids the dumbed-down fads, in this case eschewing the sonic affectations of hyper-compression and distorted vocals. Jah Sun’s new release is not only a nice album to dance to, but its lyrics are also good for lifting your spirits.